The Bingham Diaries: From Vomit to Free Stuff! What a Day! From Vomit to Free Stuff! What a Day! I woke up to the lovely aroma of vomit, and have had to shower a certain toddler more than once today. But now that her system is empty, she seems to be, dare I say it, BETTER. Do babies, excuse me, TODDLERS get food poisoning? Cause seriously. Girlfriend is happy now. I was the recipient of a darling bracelet from the lovely Tara over at If Mom Says Okay. Be one of the first three bloggers to leave a comment on this post, which then entitles you to a handmade item from me. Winners must post this challenge on your blog, meaning that you will Pay It Forward, creating a handmade gift for the first three bloggers who leave a comment on YOUR post about this giveaway! The gift that you send to your Three Friends can be from any price range and you have 365 days to make/ship your item. This means you should be willing to maintain your blog at least until you receive your gift and have shipped your gifts. And, remember: It’s the Spirit and the Thought That Count! When you receive your gift, please feel free to blog about it, sharing appropriate Linky Love! If you are not one of the Top Three Commentors on this post, you can still play along. 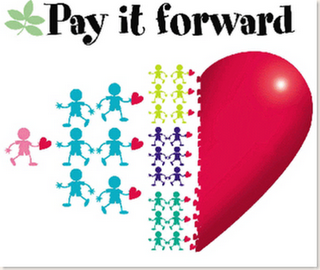 Please take the button and post it on your blog; start your own Pay It Forward chain, and encourage your blogging friends to do the same! So, here I am. Thank goodness this was on an "errand" day otherwise I might have been in my underwear with greasy hair... the very picture of perfection.